Discussion in 'SiriusXM Sports' started by semipenguin, Jan 16, 2016. Anyone wanting to talk motorsports, I guess we can talk about it here. F1. IRL. Maybe the good points of stock car racing. Although I haven't started following the progress yet, a big news story in F1 is the American Haas Racing F1 team. I know they grabbed Lotus driver Romain Grosjean for their lineup, but I don't have much else right now. I'd love to go there, it's definitely on the list for the wife and I. The F1 season kicked off with qualifying for the Australian GP this morning. The new qualifying format is a disaster, it may be changed for the next race. The race was a lot more interesting than what I expected, after Hamilton easily qualified on top. In the race, the Ferraris led from the start, and the new American Haas team scored serious points. 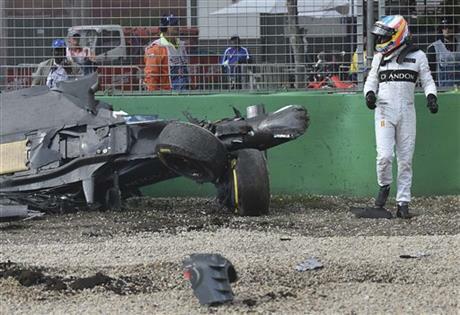 That Alonso crash was wild. It looks like McLaren Honda is more competitive this year. I hope he has accident forgiveness. Doctors have decided that Alonso has to sit-out this race.